The approval for the submarine base had been awaited since 2010. Now, Phase II of Project Varsha gets 676 hectares of forest land while Phase I work is in full swing. New Delhi: India’s secret nuclear submarine base coming up on the east coast has got a shot in the arm with the Central government approving the diversion of forest land needed to house a strategic technical area and a command and control centre. The in principle forest clearance for the acquisition of 670 hectares of forest land in Rambilli off Visakhapatnam in Andhra Pradesh had been pending since 2010, and was needed for the second phase of Project Varsha, the code name for a naval base that will house nuclear-armed submarines. The project had come up for discussion several times – including in April 2013 and January 2016 – only to be delayed due to concerns of its impact on the environment. However, the Modi government took a call to go ahead with it in a meeting last month. The clearance for the second phase of the Naval Alternate Operating Base (NAOB) will now pave the way for work to start on expanding facilities to safely house recharge stations and technical support areas for future nuclear-powered vessels of the Indian Navy. As per the proposal, which was given the green nod on 20 December, the total construction area will not be more than 1.94 hectares of the forest land. This will include a strategic technical area, a command and control area, as well as a strategic institutional area. While the hill areas of South Rayavaram, Dimili, Mamidivada, Sitapalem and Z Chintuva were also surveyed, it was found that only the land under the reserved forest at Rambili and Kalavalapalli was “technically and strategically suitable for the very important defence project under DRDO”. In its proposal, DRDO had said that the forest area was desirable as it would help “act as camouflage for defence needs”. The area is located at the Sarada river and the naval base is coming up at the place where it opens up into the Bay of Bengal. This is the latest in a series of clearances by the government to strategic defence and nuclear projects in the past three years that had been pending, in some cases for decades. The clearances include a new missile testing range in the Andaman Islands and at least two strategic facilities in Madhya Pradesh. The DRDO, which is tasked with creating infrastructure for strategic forces, had in the past found great difficulty in acquiring land for critical projects needed to store, service and manufacture equipment for nuclear assets like missiles and warheads. The area which has been given for phase II of Project Varsha is mostly degraded forest area with shrubby growth of vegetation. The in-principle approval was given on the condition that construction and non-forestry activities will be restricted to a minimum. The DRDO has been cautioned against any activity that may adversely affect the area’s ground water and any other mining or construction related activities. The Rambilli Naval base, located 60 km south of Visakhapatnam, will be spread across 1,590 hectares where the rivers Varahat and Sarada flow into the sea. The base will be an “exclusive enclave by deepening at natural channel to have easy access to sea”, and will have extensive underground storage facilities. Open source satellite images show that a lot of work has been completed in the first phase of the project, with more than a dozen tunnels being dug to create the underground facility. Also, just 20 km away at Atchutapuram, the Bhabha Atomic Research Centre (BARC) is constructing a research and development complex that will support the submarine base. About 845 hectares have already been handed to BARC for the new facility. 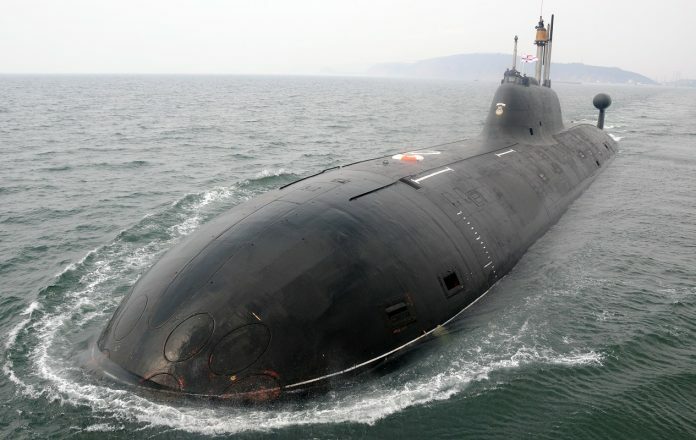 India is planning to construct at least five nuclear-armed submarines under the Advanced Technology Vessel (ATV) project that will eventually be capable of launching missiles to a target range of over 5,000 km. These are the Arihant class of submarines that are critical for the second strike option in case India is hit with a nuclear attack. 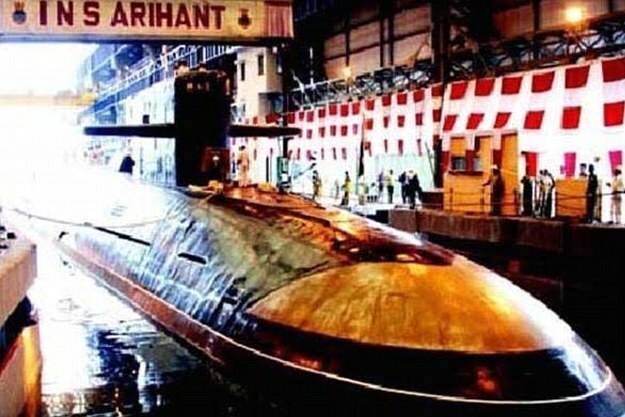 The first of its class, the INS Arihant, is now operational, while its successor, the Arighat, is being outfitted at Visakhapatnam. Besides, India also plans to build at least six nuclear-powered but conventionally-armed submarines to operate as stealthy escorts for major battle formations and strategic assets. actually all presstitutes got jobs in these so called foreign funded news websites like print wire quint and backed by congress all the reporters on these platforms used freedom of expression to write anything and everything they are so called highly educated but when anything goes against them they become congress hope they know what congress means. India’s military thinking is strongly influenced by medieval fortresses. Like INS Kadamba, INS Varsha too is an aggregated target for the enemy to take out. India never learns because it has wiped out History along with merit, intellect, integrity and professionalism. Military strategy demands the ability of adequate force to be present wherever threats emerge in quick time with minimal cost and investment. I have maintained since the 1970s, for example, that India does not need Aircraft Carriers. It is a doctrine and expense entirely unsuited to India’s military requirements and is simply a “me too” method resulting from the absence of original and purpose made, fit for purpose strategic and tactical thinking on India’s part. What India needs is several nuclear armed nuclear submarines for deterrence, and tiny bases all over the Lakshadweep, Minicoy and Andamans among which attack submarines, helicopters, multi-role fighters, missiles, reconnaissance come depth charge/torpedo amphibian aircraft, long range torpedo boats, and long range light destroyers can be deployed, moved around and concentrated at will. Backed up with a strong Coast Guard and a distributed fast destroyer and attack submarine home fleet.. Welcome step from Govt. You can’t keep yourself lagging behind the world, when it comes to security of country. In the changing geopolitical scenarios in the South Asia, it’s very imperative to secure ourselves. India ka secret projects ka khol ke dikhaanewale prestitutes ko kab bhagwan buddhi dega nahi pata. The current government looks very patient. Legal action needs to be taken against media houses that reveal the classified military information. You said it, “Legal action needs to be taken against media houses that reveal the classified military information.”, and you are ABSOLUTELY RIGHT. But the Information they reported is already in public domain, i.e., released in Public by the Government in response to ensuring their duties towards citizens/country. Agreed with your point of concern Manju..
Don’t understand the purpose of such column. Why on earth we reveal secret location of our defence establishments to the entire world? Do we ever see such news by chinese media? Very foolish and irresponsible act by Indian media to come out with such news.. The Purpose is just News and nothing else. Besides, these information are always in public domain. So, even they don’t report it, your concern for leaking defence info gets no heed in any manner. The Governments, around the world (even India), are capable of getting these info, and much more than this, without any trace of difficulties. Try visiting Chinese media websites, they do report such news and keep in mind that China has huge control over their digital network. Every government controls the amount of info released in Public, whether directly or indirectly. So, I would say, they are not foolish and are being responsible to their jobs at being a media.